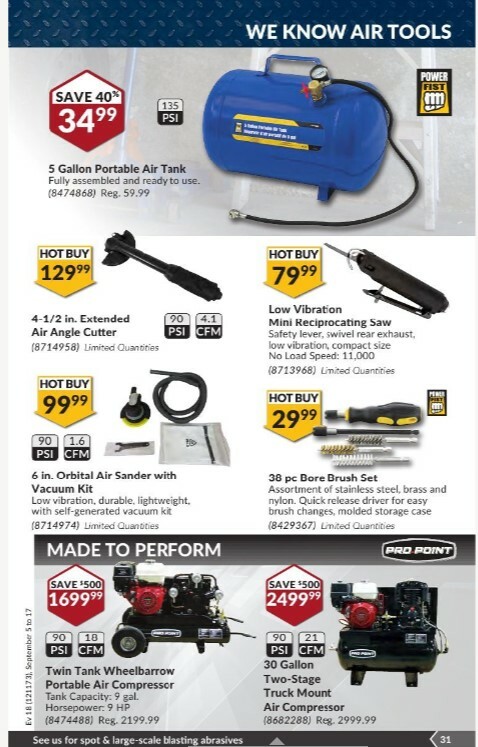 Princess Auto Pressure Washer tools flyer Sep 17, 2017. We know air tools Power Fist 5 Gallon Portable Air Tank #8474868 This was selling for $59.99 last week - Sale Price $34.99 save 40% Savings Fully assembled and ready to use. 135 PSI. 4-1/2 In. Extended Air Angle Cutter #8714958 - Sale Price $129.99 Limited quantities. 90 PSI, 4.1 CFM. Low Vibration Mini Reciprocating Saw #8713968 - Sale Price $79.99 Safety lever, swivel rear exhaust low vibration, compact size no load speed: 110000. Limited quantities. 6 In Orbital Air Sander With Vacuum Kit #8714974 - Sale Price $9.99 Low vibration, durable, lightweight, with self-generated vacuum kit. 90 PSI. 1.6 CFM. Power Fist 38 PC Bore Brush Set Model #: 8429367 - Sale Price $29.99 Assortment of stainless steel, bras and nylon, Quick release drive for easy brush changes, molded storage case. Limited quantities. Made to perform Pro-Point Twin Tank Wheelbarrow Portable Air Compressor Model #: 8474488 Regular Price $2199.99 - Sale Price $1699.99 save $500.00 Tank capacity 9 gal. Horsepower 9 HP. 90 PSI. 18 CFM. Also find Pro Point 30 Gallon Two-Stage Truck Mount Air Compressor Model #: 8682288 Regular Price $2999.99 - Sale Price $2499.99 save $500.00 90 PSI. 21 CFM. 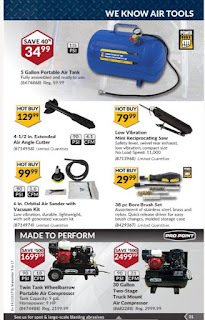 Learn more princess auto air compressor, princess auto tools, princess auto catalog, princess auto brandon, princess auto pressure washer check Princess Auto Flyer for detail all product and price.